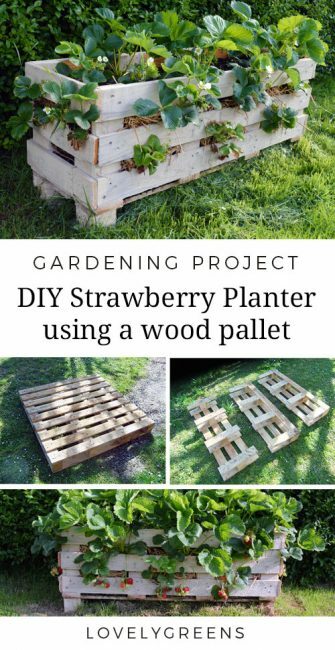 Full written and video instructions on how to make a strawberry pallet planter using a single wood pallet. Once made, you can paint it and use it for years to grow berries in your garden or on the patio. It’s a great handmade planter that not only looks great but is functional and inexpensive to make. Full video at the end. For this project you’ll need a heat-treated wood pallet, a handful of tools, and an afternoon to put it together. Plant it with strawberries in spring and by summer you’ll be picking fresh berries from your patio. 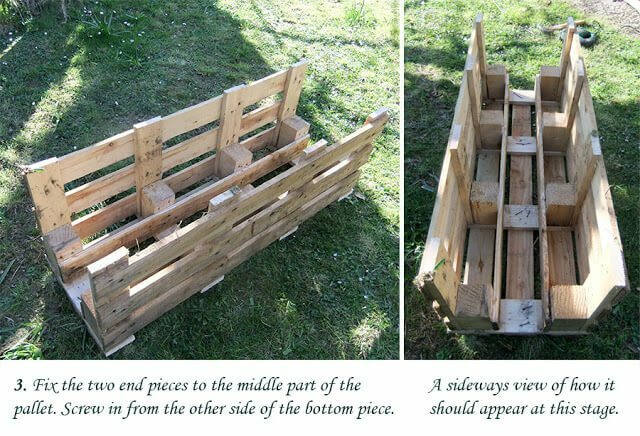 Over the past year I’ve come across scores of diy pallet projects, some of them intriguing and others not quite there yet but still having potential. 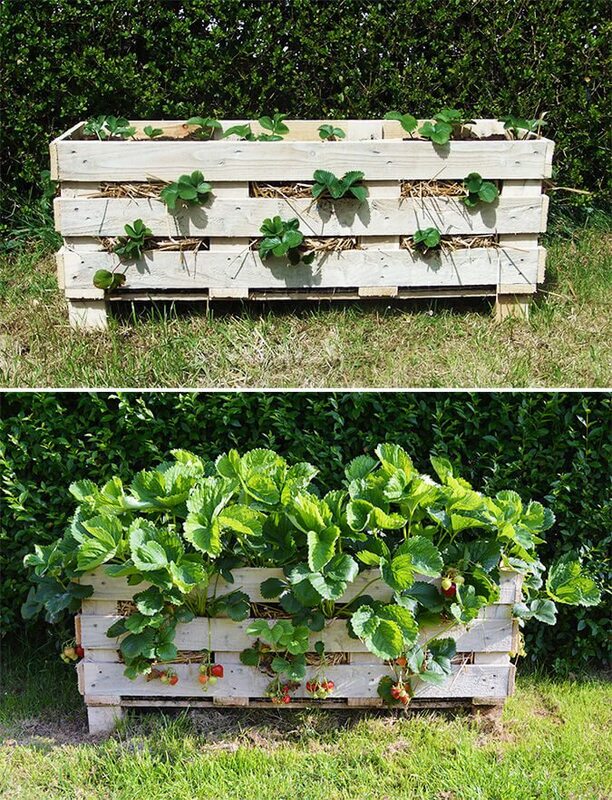 One that I see time and again is the idea of using a single wooden pallet as a strawberry planter. Filled with soil and with plants inserted in the gaps they’re usually leaned up against a wall but sometimes bolted on to keep from tumbling over. It’s a clever idea but I’ve steered away from trying it myself because I suspect that they’ll require constant watering and erosion control and also because I’m not convinced that they’ll work long term. Almost every image I’ve found of pallet planters look to be newly planted rather than a tried and tested design. Still I was interested in the idea and with the gift of eight pristine wooden pallets, I started scouring the internet looking for alternative tutorials. Ones that offered increased stability, more soil capacity and better aesthetics. Eventually, after finding nothing that really jumped out at me, I came to the conclusion that I’d have to come up with my own design. 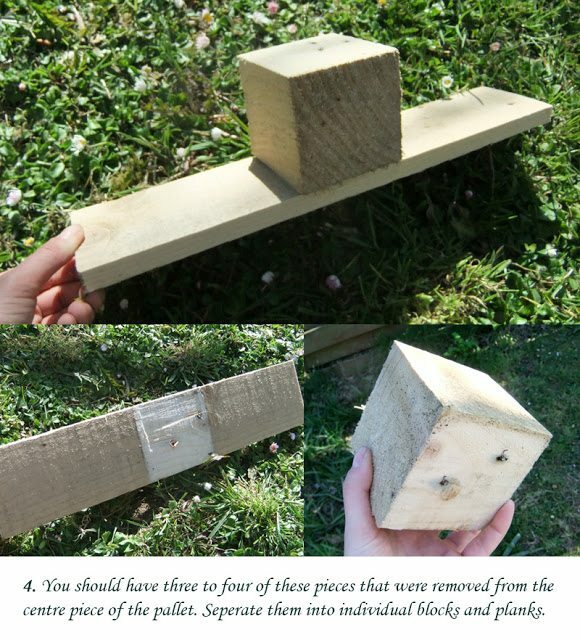 After thinking about the process for this post I’m quite sure that anyone who is comfortable using a hammer and hand-saw could complete this project too. Though I’ll be honest and say it’s much easier if you have a jigsaw and a few other extra tools. First of all, choosing pallets for diy projects involves a bit of know-how. You need pallets that are in good condition, without rot, and which have not been treated with chemical insecticides. Most people are probably not aware of this but pallets that cross international borders must be either heat treated or sprayed to stop the spread of foreign pests. Whether you think this is a good idea or not, you certainly do not want pesticide-soaked furniture or objects in your garden let alone your home. Not only can it kill off insects that eat your crops but it can indiscriminately kill all the beneficial insects too. There’s also the possibility of your plants absorbing these chemicals into their tissues and into your tasty strawberries! To help you find the right type of pallet for your project I’ve put together a diagram of what to look for when you spot one. 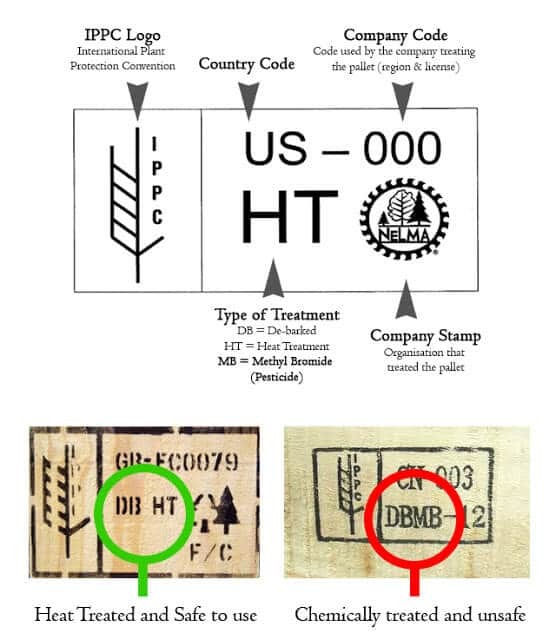 By international law, a pallet must be stamped twice with certain information which includes whether it’s been sprayed. Keep clear of any pallets that have been printed with the letters MB. For this project you will also need to look for a pallet that has six or nine planks making up its main surface. The reason for this is that the first major step will be in slicing the pallet up into three equal sized pieces (both six and nine are divisable by three). If there’s such a thing as a pallet with twelve planks then all the better because that means you can build an even larger planter. For this tutorial I’ve tried to use a series of photos to illustrate the various steps. As a beginner wood worker, it’s easier for me to understand what I’m meant to be doing if there are visuals – I hope they’ll help you too. After the main construction sequence I’ve also listed more in-depth instructions. This is easier said than done if you don’t have the right tools. Since pallet wood that has been heat treated can be brittle if you try to pull the plank off with the tongs of a hammer. If you have a heavy Splitting Wedge then I recommend that you use it to separate the block and the plank and sever the nails in two. If you’re planning on doing any more pallet projects you could really save yourself a lot of tears and invest in one along with an Iron Mallet. If any of your pieces have bits of nails sticking out then try to hammer them flat. Well almost. Turn your planter right way up and have a look at it. Does it feel sturdy? Are the feet wobbly? Are there extra bits of wood sticking up that you could trim back? Once you feel the planter is complete then either plant it up as is or use a non-toxic outdoor wood paint to paint the exterior. Being wood, this piece will eventually rot down but some tlc now can help extend its life. Soil and compost will erode through any unprotected opening in the sides or bottom of the planter. Putting down your choice of barrier materials will help keep that soil where it’s supposed to be. I chose to line the bottom of my planter with scraps of wire then a layer of Landscaping Fabric or plastic that will let water out but keep matter in. Since I placed my planter against a hedge I also chose to roll the black material up the back since I won’t be planting any strawberries on that side. On top of the fabric and running up the sides I used straw as an organic erosion barrier. For full planting instructions for this planter, including a video, visit this article. Here’s a before and after shot of how my planter looked on the day of construction and how it looks today. In two months the plants have grown enormously and I’m picking ripe berries every day. I’ve planted my container with two types of strawberry and the most prolific are the ever-bearing variety that should produce fruit for most of the summer. Could you attach the feet to the bottom before attaching the sides ? Love this idea. Question what ratio of compost to manure to use. For beginners it would be nice to explain the thickness and mixtures. Thank you. I love berries of all kinds! I’ve tried different mixes throughout the years and to be honest, pure garden compost or pure, but fully composted, farmyard manure will do. Strawberries are hungry feeders and love being planted in pure compost. Saying that, the multipurpose compost you’d buy at garden centres often only has limited nutrition. Homemade stuff is much better. I stumbled upon this project while searching for ways to grow strawberries in containers. The video was such an inspiration I found a pallet and made a box this weekend. It’s lovely to look at, sturdy and functional. The only addition I made was to add casters to the feet so I could move it around my patio to follow the sun through the seasons. Thank you and I will be revisiting your site for more inspiration. I love your idea,,thank you for posting it and doing the step by step instructions to that is very helpful!!! I’ve been trying to figure out something to do with pallets because I knew there was a way to make things such as this and you handed me a plan on a silver platter,,thank you very much now I can’t wait to get this started,,I just have to find some pallets and I think my husband can bring some home for me!!!! Thank you, Tanya, for all these great posts and tutorials. I’m reading your blog and applying them. My garden is transforming! You’re so welcome Steve — happy gardening! Thanks so much for posting this. The guide to the codes on the pallets is especially helpful! I loved you idea so much I built a whole raised garden out of pallets. I followed your design for first planter. Boxed off area for the raised garden and built square planter as well with no gaps. I am really happy with the way it looks and hopefully will be enjoying fresh produce soon. How many plants could you get in your planter? I would like to try and don’t know how many to order. Thanks! What an outstanding and detailed post! 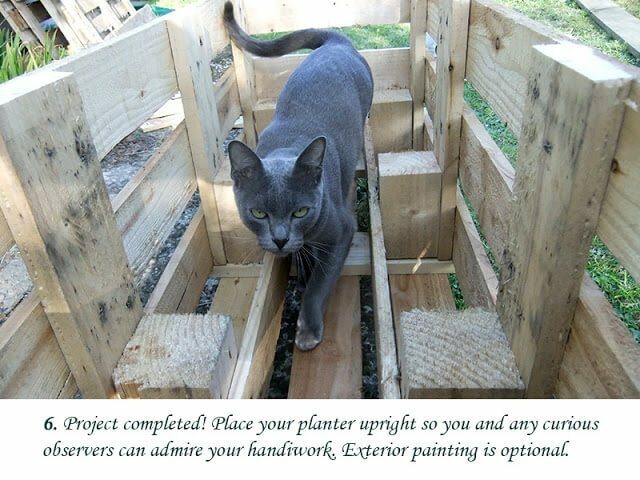 Love the idea and you did a really good job at building the planter! Thanks Sandos! There’s a subscribe link in the right column for my bi-weekly newsletter. My daughter and husband are making one of these as her 4H project. Thanks for the great tutorial! Lots of hungry birds & raccoons in my area – any ideas for how to keep them from devouring all the berries?! Before the plants put on berries, scatter small, round, red, plastic Christmas ornaments around the planter, as if they were berries. The birds and critters will check them out. By the time you have ripe berries, they will have checked the ornaments and found them inedible. They will have lost interest in your planter. Works for tomatoes, too. Interesting idea but scattering small plastic anything will be a hazard for animals and the environment. Stones painted red could work the same way though. AWesome. When you put the soil, did u just pour it in and mix the seeds in it? I’m literally planning a ‘planting-up’ video and blog post. But to answer your question, I used plants. a facebook page called living off the grid totally ripped you off on this. They even use your pictures. Not that it will do any good, but I ripped them for it. On the up side, it did lead me to your blog. I like it an have subscribed and liked your facebook page. These online plagiarists make me so angry. Thank you for finding my site and tutorial though Joe, and for letting me know. Question – How do the squirrels take this? I have a ton of squirrels, rabbits and people who walk by and love strawberries. I can deal with the people but the rabbits and squirrels I am not sure about. We don’t have squirrels here so I’m not able to help you with advice on that account. As for rabbits, slugs, and snails though – keeping the berries off the ground has helped! Scroll back up. I posted a really good tip using red Christmas ornaments. Thank you, this is such a great idea! Curios to knw if has the timber has started deteriorating at all? 2.5 years on and my first one is still going strong! So this was initially created in 2013. Are you still using this planter? Did it function as well as in ground? Since then I’ve made another and they’re both going strong! 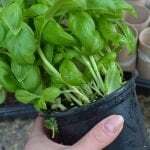 I grow in the ground as well and would say that if you have the right compost mix in the container then your plants will be just as productive as in the garden. I'm getting pallets as we speak for strawberries, and it made me think of another question. 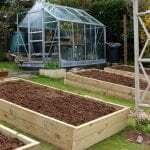 Do you or anyone else know if asparagus be grown in a raised bed like this? Personally I wouldn't do it myself. Asparagus crowns need a lot of space underground and the dimensions of this planter wouldn't be the best. If you do try growing them in it, I'd love to hear how you get on though! I love this idea. Your directions are very detailed and should be easy to follow. What are the dimentions of your planter, I didn't notice them above. Of course it probably would vary according to the pallet. Just finished building my planter. My pallet was set up differently then yours however I figured it out and it looks awesome! Now I am waiting for my strawberries to arrive and it to be warm enough to plant. Super stoked! The tutorial was great. Thanks for posting!! 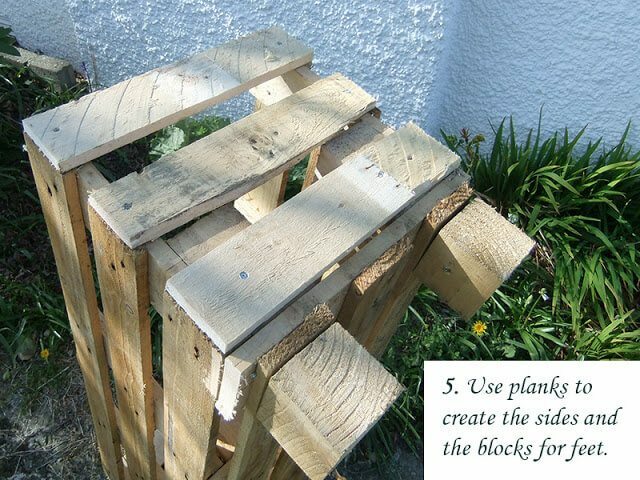 I must have a go at this with the one of the pallets I collected before breaking my leg! Any chance of the final dimensions of the planter? (height, width depth) Thanks! It's all dependent on the size of pallet you begin with. The width will be the standard width of a pallet, and the height 1/3 the height of it. Where would you place this in relation to a home – north, south, east or west side? Thank you for sharing your idea. I had given up on my strawberry patch, but this has renewed my enthusiasm. Strawberries need sunshine to produce fruit – mine is situated on the south side of the house. I also appreciate the info on chemicals. This is the first post regarding re-using pallets for projects, that I have seen, that makes any mention of how the wood has been treated. Great tutorial, thank-you! My pleasure and have fun making one of your own! FINALLY a re use pallet post that has real info, esp the stuff about the chemicals on them …most can't be bothered to even post this !! This is one pin that I will be able to re use over and over!! Thank you so much and I'm very pleased to share the pallet wood safety info. You're right that most people don't make mention of this which makes me think that not as many people are aware. 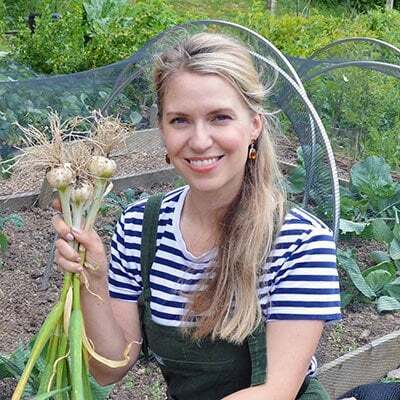 This would be a great project for community gardens Tanya, will definitely be bookmarking and sharing this. Thank you for sharing Dee! i love your strawberry planter box idea.so im going to have ago at this brilliant project .thanks for your time to show us all. Thanks so much for the tutorial of the panter and how to plant them! We are doing our first garden this year and I'm super excited for strawberries! My boyfriend made the planter for me but we were wondering how many plants you planted and if you planted the strawberries only on the sides of the planter in between the slats, or across the entire surface of each layer? Sorry if that makes no sense lol I'm having a hard time figuring out how to pose the question! Thanks again! 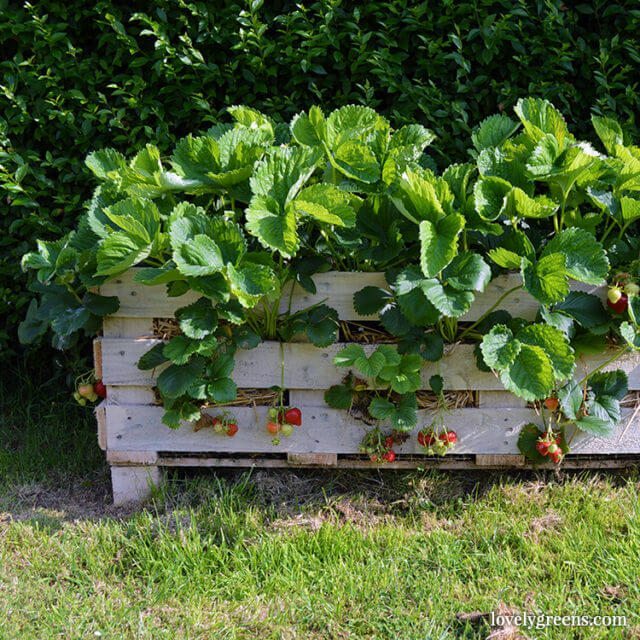 Love your way of creating a strawberry planter using pallets. I have this weird love for projects using pallets, but can't decide on which ones to do. This is going to the top of the list. Oh, and thanks for explaining treated vs untreated. I hadn't seen that yet. also looks like it will eliminate the crawling bugs-eating-the-strawberry problem I have. I bet erosion wouldn't be a Problem if you used the Bottle Waterer Idea. What do you do about the runners? I've read on other sites to keep them and then I've read to cut them. What do you with yours in pellets? I was thinking of putting this in my front yard, in front of my windowsill. But I've read birds love strawberries as much as we do. This seems easier to put a net over than growing it on the ground. Thanks for the idea. Thanks for this idea, I found a slightly different pallet but it came out fine for a raised veggie bed. That's great to hear Sheryn…would love to see a photo! If you have a chance, will you post it on my Facebook page? After weeks of looking tutorials on line! thank youuuuu!!!!!!! soooo much easier with the pics!!!! I'm going to try this. What state are you located in, and what particular strawberry plant did you plant? I'm in the UK! The strawberries I planted into the container are called Malling Opal (an everbearing variety) but I also had a nameless variety that I put in the bottom slots. We're located in Florida, USA. They grow strawberries here in my home town, so I sure hope this works. Thanks so much for your great idea!! We already found ourselves a pallet with the correct stamp on it! Any other tips for us? i mean can i plant and leave it on its own to grow. i am waiting the next post coz am very i need to starb but does reqiure attetion time is problem. To solve the problem of the cold, I think it would be fairly easy to frame a hoop house around the box. I can only container garden and hoop houses in the winter save my plants. Thanks for sharing this! I can't wait to give it a try! Prolly dumb question but im new to gardening entirely will be attempting to make this since my son is a strawberry fiend!!!! Did u plants seed inside this box? or start seedling indoors then transplant? Not a dumb question 🙂 I started with bare-root strawberry plants that I potted up and grew for a month before planting inside the pallet planter. Planter finished. Wow, that was the best constructed pallet ever. I think it is oak. Had a heck of a time getting it apart. Strawberries go in tomorrow. Love this idea! Thank you! My strawberries started to take over more real estate then they were allotted. Now they have their own little condo. 🙂 Thanks again for the great idea! I've just stumbled across your blog and found this post. 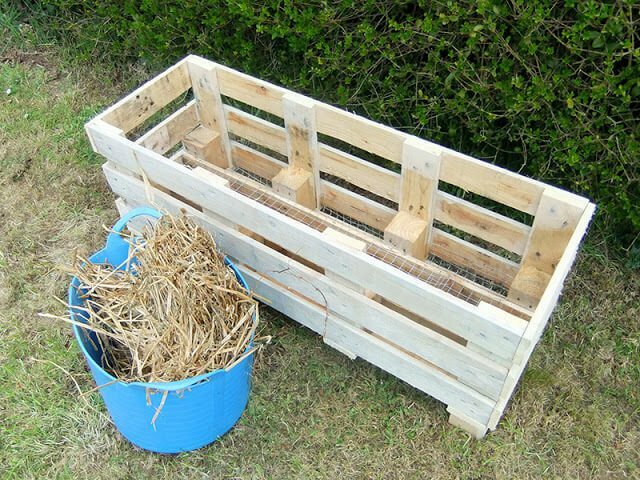 The pallet planter is a perfect project for me and the hubby to tackle. We have ducks and they tend to root around in plants so I can grow things in here which they can't reach! We make stuff from pallets around our place. Thank you so much for including the info on how to check whether a pallet has been treated with pesticides! I also love your strawberry planter. We will be using your plan this fall when we plant more strawberries. Great idea! Absolutely! Whether a pallet has been treated with Methyl Bromide or not, there's a concern about what exactly has been shipped around on the pallets and if the wood has been exposed to any contaminants. The part I'm confused about is putting the starters in the planter. My spacing between pallet decking is wider than yours, is that okay or will soil fall out the sides? You said space the starters 14" apart which I get, but how much soil do I put on top of each layer? And as far as orientating the starters do I do it like the figure below? If you're worried about soil spilling out you might want to line the inside of your planter with that weed-resistant material you can buy at garden centres. It lets water drain through but holds soil in and will also stop weeds from taking root in the side slats of your planter. When you've figured out where to place your plants just slit a hole in the material and push the plant through. Hubby brought me home some really good pallets,I already have a strawberry garden that does great so I am going to try these out on my tomatoes,peppers and zucchini,wish me luck! It looks great Tanya…..I do love both DIY and recycling projects so one that combines both is just great!! Tanya, I'm so impressed with your ingenuity. I think it helps that you have the right tools to speed up the job. My son tried to take a pallet apart to build a frame for a school photo project and it took him ages! The planks just wouldn't separate as hugely long nails had been driven in. Once the pieces were broken up, we still had to deal with the nails. You seem to have avoided that problem and come up with a well designed trough for your plants. It's an idea I'd love to copy – the finished piece is rustically beautiful. Oh yes, same here with taking a pallet apart. The wedge helps with that but it really takes a LONG time. I look forward to seeing how your strawberries grow! The plants are doing well so far…my only concern is that birds might try to get at the fruits so I might have to net the box eventually. 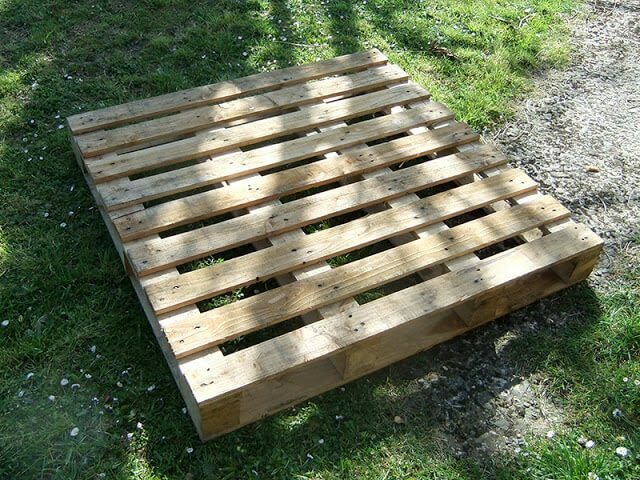 I had my first set of pallets and decided after seeing your post, that this would be my first pallet project. With the help of my hubby, we broke them down, then built two of these in about 2 hours. We still have to put the liner, soil and plants in, but I am very pleased with how they turned out. Thanks so much for the great idea! I'm def going to try this. My wife has been telling me that we don't have room for strawberries. I have so many other veggies going, but I have no fruit, so it would be nice to finally get some going……..Can't wait. That's fantastic, clever you. The tutorial is really handy, and it is so useful to know about the printed symbols on the pallets. I'm betting the strawberries will do really well in there, with so much space, fantastic soil and not too many slugs and snails. Maybe you could put something around the feet of the planter to deter them further – gravel or copper perhaps. (Last year they ate almost all of my strawbs – the ones that didn't rot in the rain that is!) A really great post, it must have taken you ages, thank you. Love the idea of slug-deterring copper around the legs…genius! The project itself is pretty quick and should only take about an hour and a half, start to finish. Planting it up probably took another 45 minutes so really just an afternoon. I'm told that slugs are deterred by using epsom salts to fertilize garden plants either disolve a tsp to gallon of water and use to water or mix about 1/2 cup into soil used for planting; also told to use aluminium pie plates and stake down or fill with gravel beside cabbages or other plants that have slug issues; also, thinking might do a planter for strawberries and one for herbs on back porch; handy to kithen; and another for cucumbers and one for squash because we do the raised bed gardens and it would save space on the viney plants that use more room! Looks great! Hope it works Cuz I want one too. 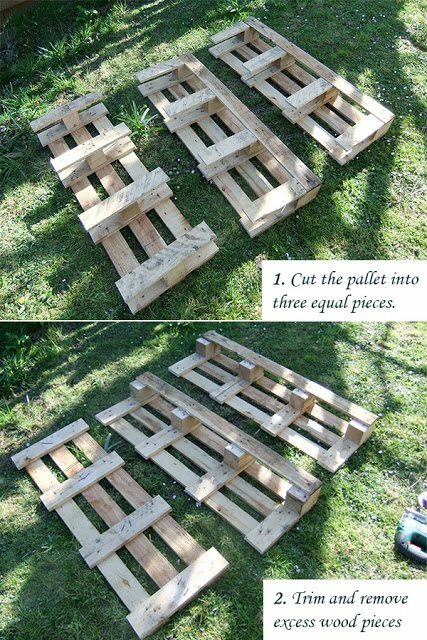 I was going to tear apart a pallet to build planter boxes for my veggie garden, but this seems a lot better.Great idea! Thanks! What a great tutorial. I hope you get a great strawberry harvest from it. Me too Jo! I'm thinking about sowing some radishes on the top as well – there's plenty of space between the plants. that is such a brilliant idea – I've been looking for a first project to tackle and this could be just the thing! Am glad you like the project Richard – let me know how you get on if you end up building one? I just love this idea and I think it is much better than the pyramid one I was going to make. Just wanted to ask if the plants can stay out in the winter in one of these? I live in Columbia, MO and our winters can get pretty cold. Hi Jayne, if you were concerned about freezing temperatures, maybe move your planter into a greenhouse over the winter. Since it would take a couple of very strong people to move it once it's filled, maybe you could think about attaching wheels to the feet area instead of the blocks? This is awesome! And I love the wheel idea! Thank you for your blog, it’s so inspirational! Wouldn’t they overwinter outside of a greenhouse with a thick layer of straw mulch as well? Yes, depending on your climate. Absolutely LOVE this!! I'll be featuring it tomorrow in my Tuesday's "Three". 🙂 You are so creative. The proof of the pudding is in the eating as they say Tanya – so we shall have to wait and see now how well they fruit – but the idea looks very good indeed. Absolutely! I have a feeling it will do well but will post on its progress throughout the coming year.